Revisiting the Alien universe was always going to be a risk for Ridley Scott. Alien was the film that cemented his reputation as a visionary auteur and is rightly regarded as a classic, a sublime example of atmospheric horror. Three sequels of varying quality established a sprawling world, one that Scott had long hinted that he was interested in exploring further, his interest particularly piqued by the mysterious Space Jockey, whose fleeting glimpse in his original work posed questions that have never been answered. Whilst Prometheus puts that quandary to bed, its ambitions and scale are far loftier than merely acting as a prequel to the series, which proves to be a refreshing yet frustrating approach. In 2089 Dr Elizabeth Shaw (a vulnerable Noomi Rapace) and her beau Dr Charlie Holloway (Logan Marshall-Green) discover an ancient cave painting of a star map on the Isle of Skye, which is strikingly similar to others left behind by distant and extinct civilisations. Shaw interprets the maps as an invitation from our makers, a call to humanity to venture forth to explore their beginnings and it is this concept of self-discovery and understanding that is thematically central to Prometheus. Little time is wasted before we’re aboard the Prometheus itself, destination and mission seemingly unknown. As it transpires, the mythical Peter Weyland has bankrolled Shaw and Holloway and a veritable mixed bag of a crew to explore the distant world of the star map. The ice-cold Vickers (a glowering Charlize Theron) represents the corporate suits, whilst cyborg David (a clinical and deceitful Michael Fassbender) pursues his own uncertain agenda as the intrepid explorers seek out the shadowy Engineers who could provide crucial clues to our origin. Visually, the sweeping vistas of this distant moon are little short of stunning, a marked contrast to the claustrophobic confines of the Nostromo. No longer shackled by budgetary concerns, Scott’s famous eye treats us to an epic world that is sumptuous, grandiose and incredibly immersive. As Shaw et al investigate a pod like structure replete with endless tunnels, the film takes on a more brooding and prophetic tone as hints and flourishes of H.R. Giger’s famous production design suggest that bad times lie ahead. The subsequent discovery of an eerily reminiscent chamber and the realisation that the Engineers might not be all they seemed signals Prometheus’ descent into a degree of chaotic confusion as death comes to the fore. As the slow burning narrative flits back and forth from pod to ship, Scott teases with small reveals, confusing his audience with baffling character motivations and actions, whilst never fully divulging where this might all be going. And that’s partly the problem. Prometheus never embraces the gloomy horror that typified Alien, settling for a couple of visceral moments of body horror (one of which stands up as one of the finest and tensest scenes in the entire pantheon), preferring instead to indulge in questions of faith and mortality. But by setting his sights on such highbrow subject matter, Scott ends up raising far more questions than he set out to answer and tonally his picture ends up bearing closer comparison to Danny Boyle’s moody and spiritual Sunshine than anything in the Alien universe. Given a stronger script, Scott might have pulled off the impossible, but Jon Spaihts and Damon Lindelof’s screenplay is fudged and confused, falling into the trap of utilising characters to explain plot points verbatim which just proves crass, lazy and unnecessary. That said, it’s constantly gripping, visually luscious and superbly played, particularly by Fassbender who lends the duplicitous David an ethereal air. Rapace too is excellent, channelling her inner Ripley, but lending Shaw a greater degree of fragility. Theron too is positively arctic, whilst Idris Elba’s Janek entertains with what little he has to work with. 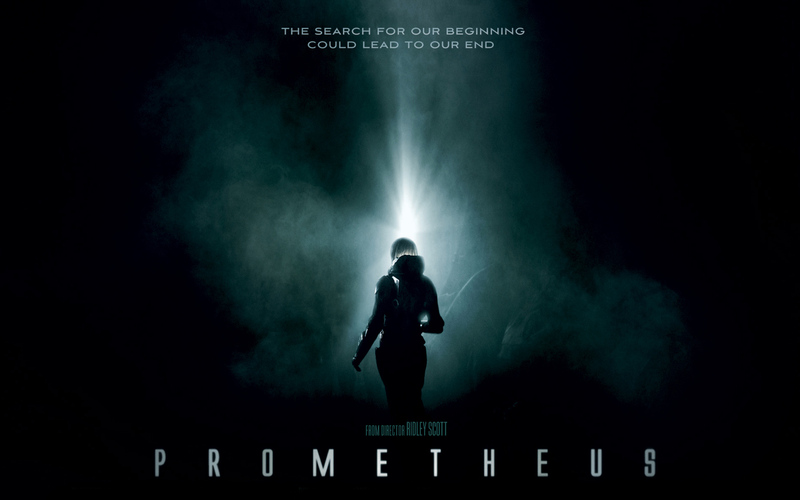 Whilst evidently flawed, Prometheus is intelligent, thoughtful sci-fi . On its own merits it’s a rewarding experience, but given the weight of expectation that Scott’s legacy has laid at its door it suffers in comparison. But ultimately, Scott should be applauded for daring to take the franchise in a new and ambitious direction and on reflection a simple origin story would have seemed like a disappointing cop-out.